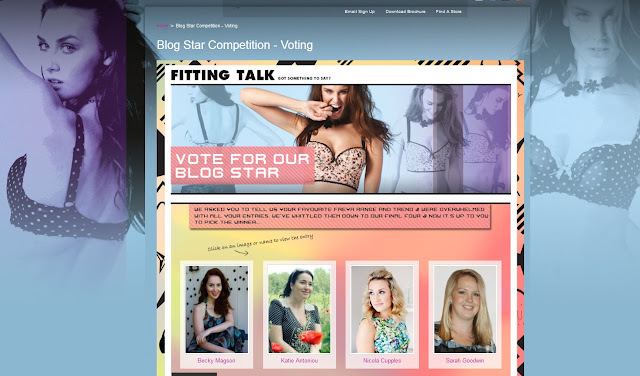 I recently entered to be the Freya blog star, which would allow me to write for and be featured on the Freya website. The opportunity to share my writing with a broader audience and write about the beautiful Freya lingerie seemed an exciting chance to be involved with a great brand. To enter, I created a moodboard and attached a written description about my favourite AW12 Freya style and the trend that it was inspired by. The immaculate 1950’s pin ups and house wives had glamour of their own. Beautiful floral and polka dots epitomised the trends of an era and today we look back on these details to create “Vintage Glamour”. GINNY by Freya is showcasing this trend with great support and structure to your under garments. The navy and white floral and a border of polka dot of this Freya style will make your man weak at the knees." I am so excited to share the great news with you, I have been named a finalist! To be crowned the winner I need you to vote for my entry on the Freya website. I would love if you could take a moment of your time a vote for me.